Every January, Alpha Phi Alpha and SUNY Oswego's Division of Student Affairs and Enrollment Management organize a celebration of Martin Luther King Jr.'s life and Black History Month with a prominent speaker, performances and other events. 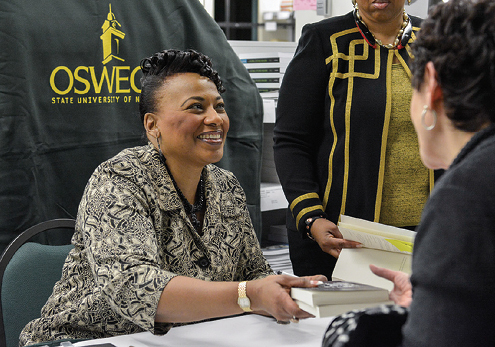 SUNY Oswego’s 27th Annual Martin Luther King Jr. celebration featured Bernice A. King (pictured below), daughter of Martin Luther King Jr. and chief executive of the King Center, and Grammy-winning gospel singer Smokie Norful. King’s speech acknowledged the impact of her father’s legacy and its relevance to social movements today. She reflected upon her father’s idea of shifting to a “person-driven society from a profit-driven society,” and that securing the well-being of people would naturally eradicate racism, poverty and other social ills. The youngest daughter of Martin Luther King and Coretta Scott King, Bernice King began her career as an orator speaking at the United Nations in place of her mother at age 17. She has brought her motivating messages to such places as the White House, Lincoln Memorial and major universities, as well as around the world in locations including South Africa, Germany and New Zealand. She continues her family’s legacy in countless ways, including spearheading the August 2013 “Let Freedom Ring and Call to Action” event to commemorate the 50th anniversary of the March on Washington and her father’s iconic “I Have a Dream” speech. As CEO of the King Center, she continues to educate youth and adults on the nonviolence principles modeled and promoted by her parents. She is a graduate of Spelman College and earned a master’s degree in divinity and a juris doctor degree from Emory University. Below is information on January 2015's keynote. Humanitarian, actor, author, health and wellness ambassador and philanthropist Hill Harper, best known for his role as Dr. Sheldon Hawkes on "CSI: NY," delivered the keynote speech for SUNY Oswego's annual celebration of Dr. Martin Luther King Jr.'s legacy on January 30, 2015 in Sheldon Hall ballroom. Winner of three NAACP Image Awards for Best Lead Actor in a Drama Series during his time as a forensic scientist on the CBS television show from 2004 to 2013, Harper earned two degrees from Harvard University, serves on President Barack Obama's Cancer Panel, has written four bestsellers and carries out his philanthropic vision with an eye to social justice. Leadership and service fraternity Alpha Phi Alpha and SUNY Oswego's Division of Student Affairs and Enrollment Management, co-sponsor Harper's talk, said Dan Roberts, diversity and inclusion committee member and coordinator of new student orientation. Harper, who received a law degree and a master's degree in public administration from Harvard, is a member of the national fraternity. Harper, now appearing as the CIA's director of clandestine services in the USA Network series "Covert Affairs," has authored New York Times bestsellers "Letters to a Young Brother," "Letters to a Young Sister," "The Conversation" and "The Wealth Cure." He recently published a fifth book, "Letters to an Incarcerated Brother." He won an American Library Association award in 2007 for "Letters to a Young Brother." The son of two Iowa City doctors, Harper's acting resume includes appearances in Spike Lee films such as "Get on the Bus" and "He Got Game," Oprah Winfrey's "Beloved," the '90s TV comedy "Married ... with Children" and such television projects as HBO's award-winning "Lackawanna Blues." He made his directorial debut with the short film "The Truth," a 2012 Pan African Film Festival Award Winner. Students, faculty and staff of the college have the first opportunity for free tickets starting Jan. 20 by contacting the college box offices at Marano Campus Center, 315-312-3073, or Hewitt Union, 315-312-2141. Members of the public can reserve a free ticket starting Wednesday, Jan. 28, for Harper's appearance, at the above box offices. Those attending may park in the employee and commuter lots adjacent to and across Washington Boulevard from Sheldon Hall. Harper's keynote will culminate a Black History Month kickoff week at SUNY Oswego that includes an oratorical contest, a musical performance and Community Service Day.